Diaphragmatic hernia occurs due to defect in the diaphragm causing herniation of the intra-abdominal organs into the thoracic cavity. While obstetricians commonly encounter diaphragmatic hernia in the unborn fetus, it is rare to encounter the same in the mother. A successfully managed pregnancy in a patient with a known diaphragmatic hernia but which was actually a diaphragmatic eventration is presented here. Diaphragmatic hernia is the herniation of intraabdominal contents into the thoracic cavity due the presence of a defect in the diaphragm. When associated with pregnancy, the condition might worsen as pregnancy causes increased intraabdominal pressure. A 31 year old fifth gravida second para with two abortions and two living issues, presented to us for antenatal registration at 12 weeks of gestation. Her first two pregnancies were uneventful. In her 3rd pregnancy she developed gradually worsening breathlessness around 7 month of gestation. She was admitted under the pulmonology department and evaluated in detail. 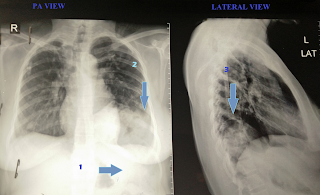 X ray chest (done with abdominal shielding) was suggestive of bronchiectatic changes and peribronchial cuffing with cystic changes suggestive of chronic bronchitis; and relative abnormal position of the two hemidiaphragms. MRI was done showing a defect in the left hemidiaphragm with herniation of left kidney along with colon and part of small bowel into the thorax. Kidney was malrotated and hilum was facing infero-laterally. Renal vasculature was maintained. She was managed with nebulisation, levosalbutamol, ipratropium bromide and budesonide. She delivered in a tertiary care hospital under close observation at 9 months of gestation, a female child of 2.75 kg. She was asymptomatic in the inter pregnancy intervals and she had no episode of breathlessness. In the present (5th) pregnancy, her above obstetric history and reports were seen. Upon further enquiry, she gave history of some surgery done in early childhood, but no documentation was available. Presence of a transverse scar extending from right hypochondrium to the epigastric area suggested that it could have been a congenital diaphragmatic hernia which was repaired. In view of cough and dyspnea on exertion, she required admission in the pulmonology ward at 28 weeks of gestation. She was managed with supplemental oxygen and bronchodilators and was discharged upon improvement. At 37 weeks, she was readmitted with similar complaints and improved symptomatically. She developed mild gestational hypertension and her blood pressure was 140/90 mm of Hg. Investigations including complete blood counts, liver, renal parameters and coagulation profile were all within normal limits. She went into spontaneous labor at 38 weeks of gestation, and had a precipitate labor. She delivered a male child of 2.416 kilograms. Intrapartum, patient was continued on nebulisation with levosalbutamol, ipratropium bromide and budesonide. Post-delivery her CT scan was done which was suggestive of focal eventration of left dome of diaphragm. There was no evidence of herniation. 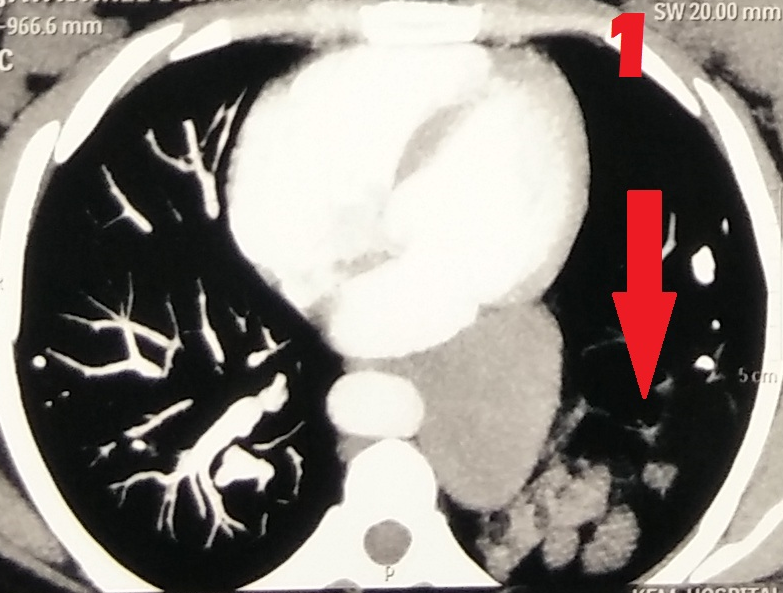 CT scan report stated fibrocavitary destruction in the right upper lobe, emphysematous bilateral lungs, fibrocalcific infiltrates in the left lung, and focal posterior eventration of the left dome of diaphragm (figure1). Post-delivery X ray was suggestive of abnormal radio densities and lucencies in the left lower zone in the retro cardiac region. Dome of diaphragm was continuous over the opacity in the lateral view. Fibrocalcific scars in the right upper zone and lower zone were suggestive of post Koch’s sequel (figure 2). Figure 1. 1.Absent stomach bubble shadow. 2. Homogeneous radiodense opacity suggestive of soft tissue, above the diaphragm. 3. Peak of elevated dome of diaphragm. Figure 2. CT scan film showing 1. Air in the bowel loops. Figure 3. CT scan film showing 1. Homogeneous soft tissue shadow (hernia sac). The diaphragm that develops during 4th to 12th week of pregnancy acts is a dome-shaped partition between the thoracic and abdominal cavities. It develops from 4 major structures namely the septum transversum, the pleuroperitoneal membranes, the dorsal esophageal mesentery and the body wall. Congenital diaphragmatic hernia (CDH) is a developmental anatomical defect in the diaphragm that allows herniation of intra-abdominal organs into the chest cavity. Diaphragmatic eventration refers to incomplete muscularization of the diaphragm resulting in a thin membranous sheet of tissue. While the neonates with diaphragmatic hernia usually present with respiratory insufficiency, adults may be completely asymptomatic till late, as was seen in our patient. They may manifest new onset of respiratory or gastrointestinal symptoms due to herniation of abdominal contents into the thoracic cavity through the defect. Various conditions can predispose to this, out of which pregnancy is one such condition. Imaging is necessary to detect diaphragmatic hernia as the symptoms are nonspecific. Gas above the diaphragm or the fluid filled viscera above the diaphragm suggest that herniated organ can be stomach or the bowel. It is difficult to diagnose if non-gastrointestinal tissue has herniated. Some features of diaphragmatic hernia were seen in our patient also, but were not severe enough to cause symptomatology necessitating operative intervention. The magnetic resonance imaging done in the previous pregnancy (of which images were not available) was suggestive of a defect in the left hemidiaphragm with herniation of left kidney along with colon and part of small bowel into the thorax. During that time also, patient only had respiratory complaints such as breathlessness and no gastrointestinal symptoms. The computerized tomography imaging in present postpartum period showed focal eventration of left dome of diaphragm but no evidence of herniation. It also showed fibrocavitary destruction in right upper lobe, emphysematous bilateral lungs and fibrocalcific infiltrates in the left lung. 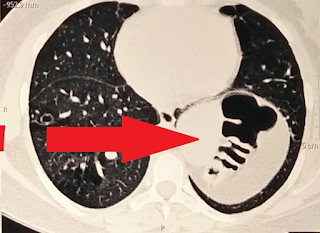 Considering these imaging reports, it appears that our patient may not have had a true recurrence of diaphragmatic herniation, but may have had only eventration. This explains the patient not requiring a surgical management during the course of her previous pregnancy and the current pregnancy. The x ray report suggesting that the dome of the diaphragm was continuous over the opacity in the lateral view also supports this. The combined effect of diaphragmatic eventration, fibrocavitary destruction and emphysematous bilateral lungs resulted in restrictive lung disease, explaining the patients’ respiratory symptomatology. Though patient required admission twice, she responded to conservative management and operative intervention was not required. Diaphragmatic hernia complicating pregnancy is rare. Chen et al had reported that only 30 reports had been published over 50 years in the English medical literature. Previously, Dumont had mentioned that more than half of the patients with diaphragmatic hernia in pregnancy succumb during pregnancy. This highlights the importance that needs to be attached to this condition when it is encountered in pregnancy. In pregnancy increased intra-abdominal pressure and gravid uterus leads to herniation of abdominal contents into the thorax. In the first trimester, maternal diaphragmatic hernia can present similar to hyperemesis gravidarum, probably due to strangulation of the abdominal contents in the thoracic cavity. Hence a high index of suspicion should be kept to include maternal diaphragmatic hernia in the differential diagnosis; especially among women who have history of some abdominal surgery. Our patient did not have any specific features of hyperemesis during the first trimester of pregnancy. However, our patient presented with respiratory symptomatology in the second trimester. A few cases have been reported wherein the severity necessitated operative intervention. Eglinton et al in their three case series concluded that consideration should be given to repair even asymptomatic hernias in the second trimester of pregnancy. Hernia can be repaired through thoracic or abdominal route. Primary repair can be done if the diaphragmatic defect is small whereas for large defects prosthetic patch or grafts are used to avoid tension after repair. Repair of hernia in pregnancy gets complicated by reduction of intra-abdominal space and decreased visualization. [7,8] The repair of hernia in pregnancy carries risk of preterm labor, fetal jeopardy due to a possible decrease in uterine blood flow or due to intrauterine injury. While the above authors have approached the diaphragmatic hernia in an open surgical manner, laparoscopic method has also been attempted successfully in pregnancy in the second trimester and even at 27 weeks of gestation. [9,10] Julien et al successfully repaired diaphragmatic hernia in pregnant patient laparoscopically using a novel right lateral position. Chen et al reported a case of simultaneous repair of irreducible hernia along with cesarean section. Obstetric management of maternal diaphragmatic hernia continues to be debatable. Dumont had advocated to avoid bearing down and vaginal delivery. However, use of forceps application to avoid intra-abdominal pressure was advocated. On the contrary, Genc et al had achieved successful outcome after induction of labor at 39 weeks. Being a rare scenario, no controlled studies can be conducted and only literature reviews can help in the matter. In our case, patient went into spontaneous precipitate labor and delivered successfully as she was a case of pseudo diaphragmatic hernia. It is suggested that all such cases be reported so that some consensus would emerge regarding the best approach to management. Pansky B. Development of The Diaphragm. Review of MEDICAL EMBRYOLOGY. New Jersey, United States: Prentice Hall (a Pearson Education Company). Macmillan USA. 1982; pg 48. Pober BR, Russell MK, Ackerman KG. Congenital Diaphragmatic Hernia Overview. In: Pagon RA, Adam MP, Ardinger HH, Wallace SE, Amemiya A, Bean LJH, et al, editors. GeneReviews® [Internet]. Seattle (WA): University of Washington, Seattle 2006;1993-2017. Chen Y, Bai J, Guo Y, Zhang G. The simultaneous repair of an Irreducible Diaphragmatic Hernia while carrying out a Cesarean Section. Int J Surg Case Rep; 2013;4(9):771–2. Dumont M. Diaphragmatic hernia and pregnancy. J Gynecol Obstet Biol Reprod. 1990; 19(4):395–9. Ting JYS. Difficult diagnosis in the emergency department: Hyperemesis in early trimester pregnancy because of incarcerated maternal diaphragmatic hernia. Emerg Med Australas 2008; 20(5):441–3. Eglinton T, Coulter GN, Bagshaw P, Cross L. Diaphragmatic hernias complicating pregnancy. ANZ J Surg. 2006;76(7):553-7. Genc MR, Clancy TE, Ferzoco SJ, Norwitz E. Maternal congenital diaphragmatic hernia complicating pregnancy. Obstet Gynecol. 2003;102(5 Pt 2):1194–6. Julien F, Drolet S, Lévesque I, Bouchard A. The right lateral position for laparoscopic diaphragmatic hernia repair in pregnancy: technique and review of the literature. J Laparoendosc Adv Surg Tech. 2011;21(1):67–70.